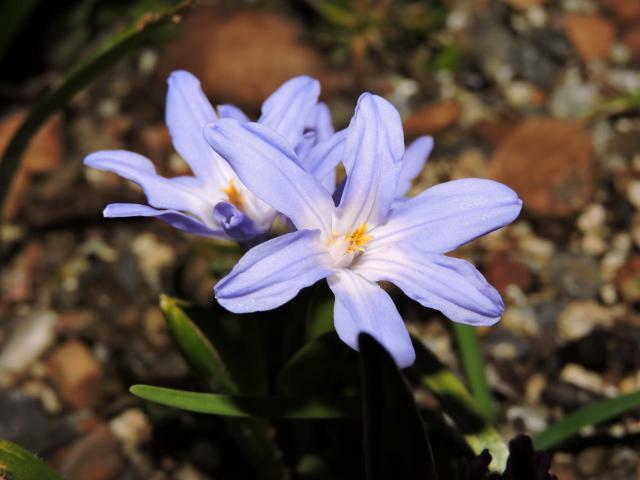 Chionodoxa (syn. Scilla ser. Chionodoxa) is a bulbous genus in the Hyacinthaceae (or Scilloideae) family sold under the common name Glory of the Snow. Species come from mountain habitats in Crete, Cyprus, and Turkey and are hardy and like cool summer temperatures as well. 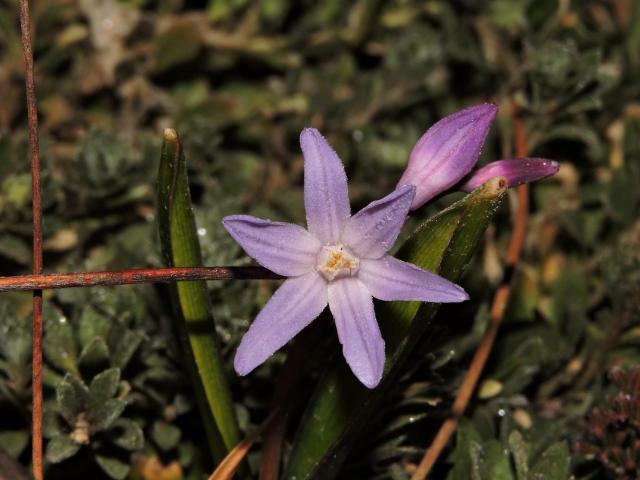 The Austrian botanist Franz Speta considers that this genus should be included in Scilla sensu lato even though he has divided what used to be Scilla into many new genera. 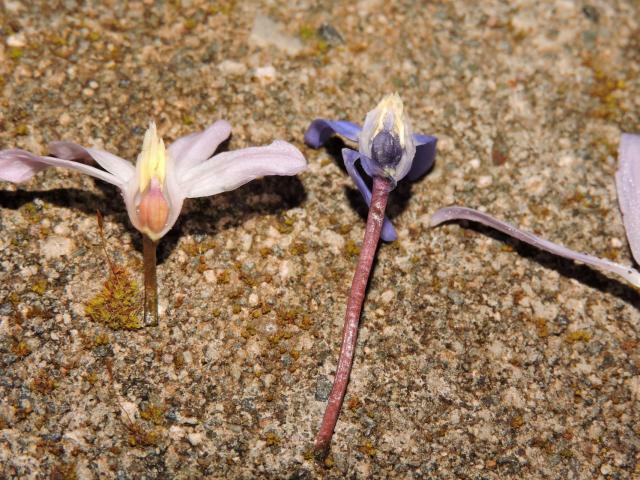 This genus was once considered different from Scilla sensu stricto by having the perianth joined into a corolla and the stamens having flattened white filaments, as well as having yellow pollen (many Scilla's have blue pollen). 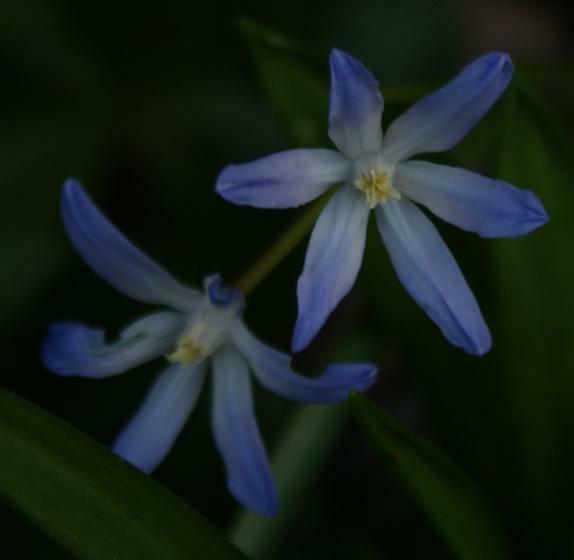 Many taxonomists have accepted the inclusion of Chionodoxa into Scilla sensu lato as a section of Scilla called Scilla ser. Chionodoxa proposed by Franz Speta. 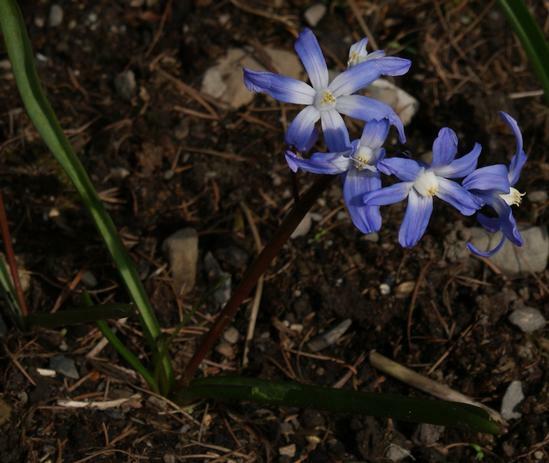 A discussion of the changes to Chionodoxa and other "squills" can be found in the PDF Squills in the flora of the Czech Republic, with taxonomical notes on Central-European squill populations. 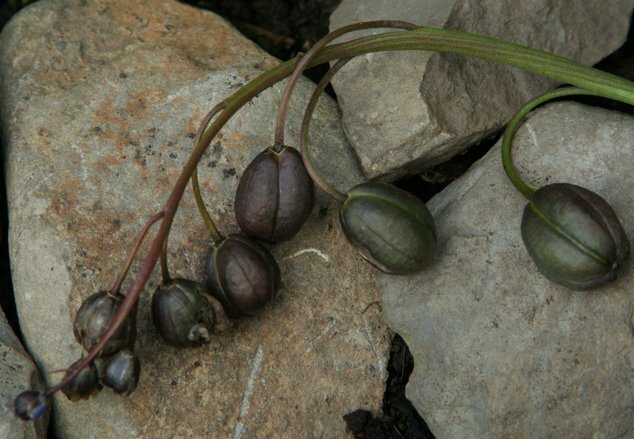 There is much confusion about the names and the same plant can be found under different names. 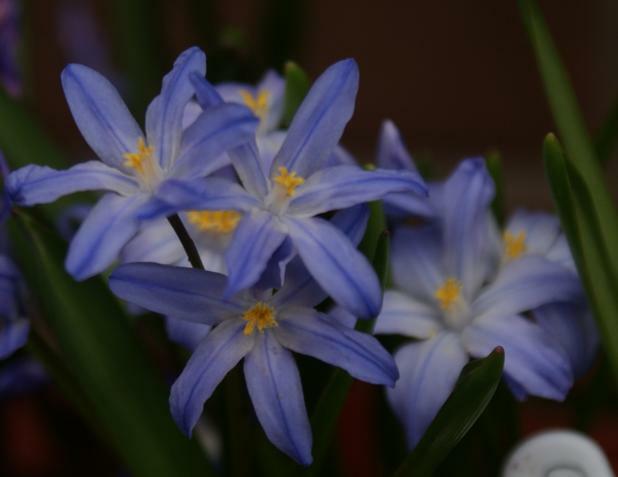 The differences between Chionodoxa forbesii, Chionodoxa luciliae, Chionodoxa sardensis and Chionodoxa siehei are addressed in the RHS publication Hyacinthaceae – Little Blue Bulbs. 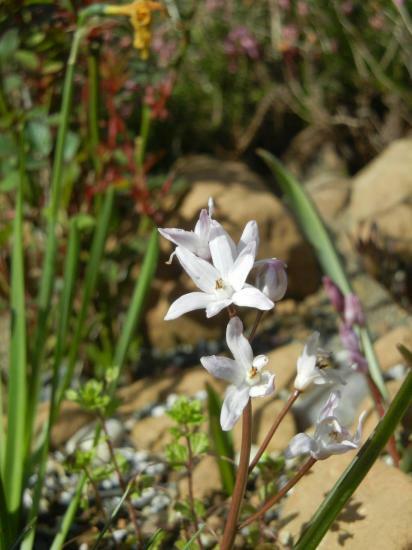 The nothogenus ×Chionoscilla was established to name the hybrids which appear when Scilla bifolia and Chionodoxa are growing in close proximity. 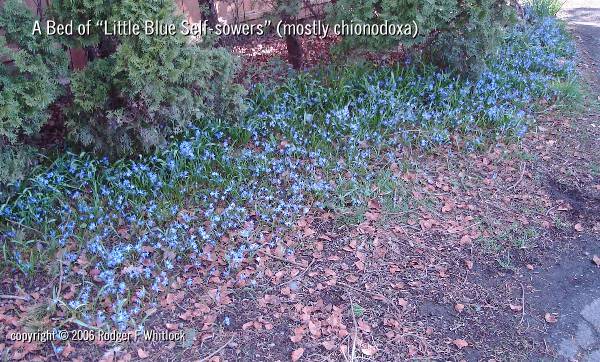 When the nothogenus ×Chionoscilla was established, Scilla and Chionodoxa were regarded as separate genera. 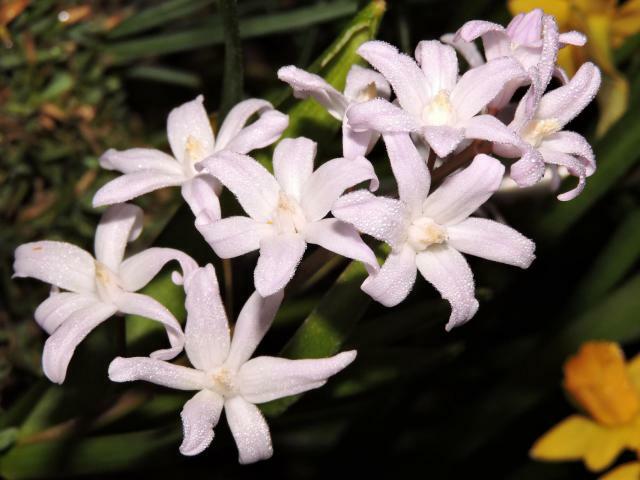 If present thinking merges these two genera, the entities formerly regarded as intergeneric hybrids would now be treated as interspecific hybrids within the genus Scilla. 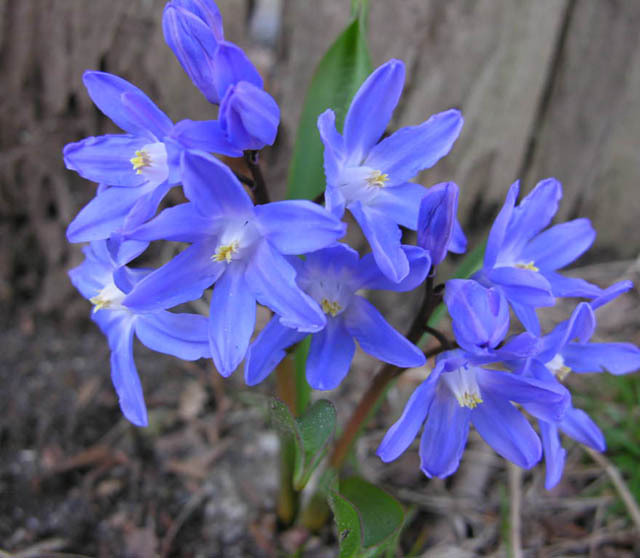 Kew is accepting the merging of this genus into Scilla. Chionodoxa forbesii Baker (syn. 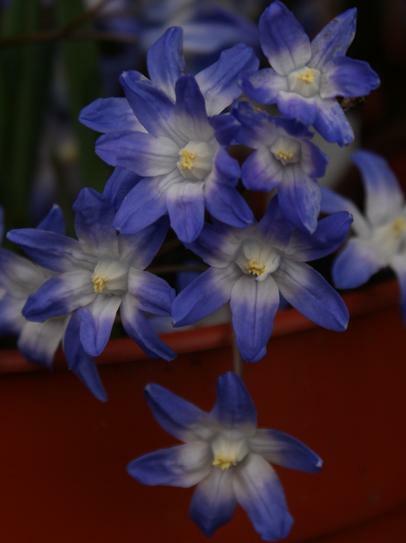 Scilla forbesii) is from the West of Turkey. 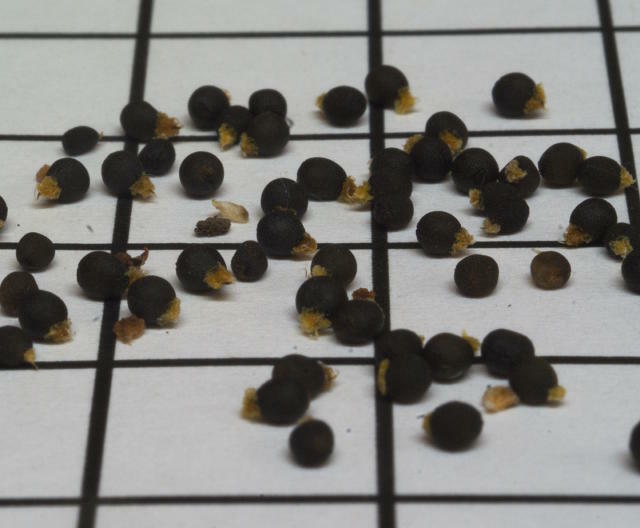 C. siehei is now merged with C. forbesii plants having often been sold as C. luciliae. 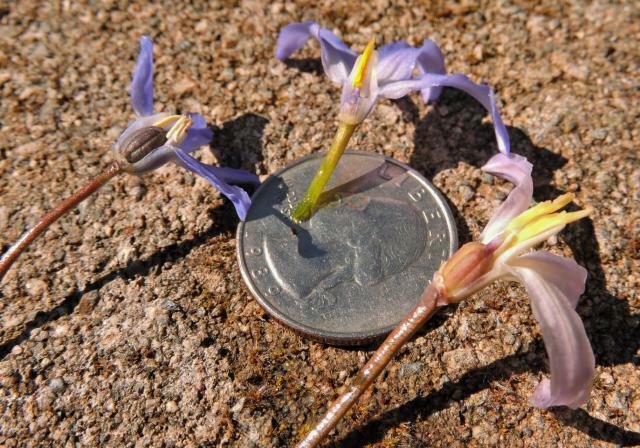 The flowers of C. forbesii are most often smaller than those of C. luciliae, with slightly more pointed tepals. The filaments and anthers are typically even in length, the filaments are wide at the base, tapering to a point. Flowers number around 4 to 10 per inflorescence, erect to spreading, with stems growing six to twelve inches (15–30cm) tall. White, blue, and pink forms are often sold in mixes or under names such as 'Pink Giant' or 'Blue Giant', though these may actually be forms of C. luciliae or hybrids. Photos by David Pilling, the third one shows C. forbesii (left) and C. luciliae. Photos by Travis Owen show different forms sold as "Chionodoxa luciliae", though they are probably C. forbesii. Chionodoxa lochiae Meikle (Syn. Scilla lochiae) is endemic to Cyprus. 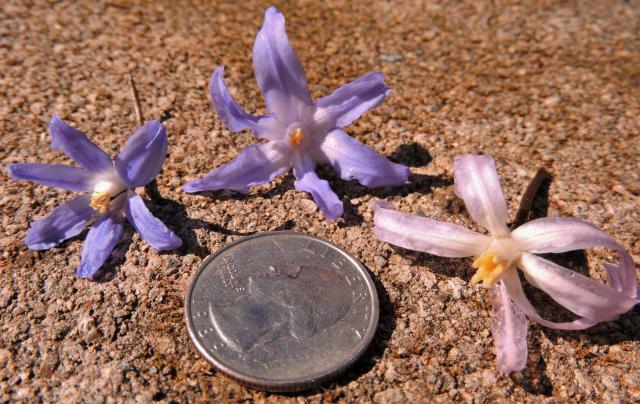 The flowers, like Chionodoxa sardensis, have no white at the base of the petals (except for the bases of the filaments), but are described as nodding. Many recent sources do not accept this species, and probably include it within C. forbesii. Chionodoxa luciliae Boiss. (syn. 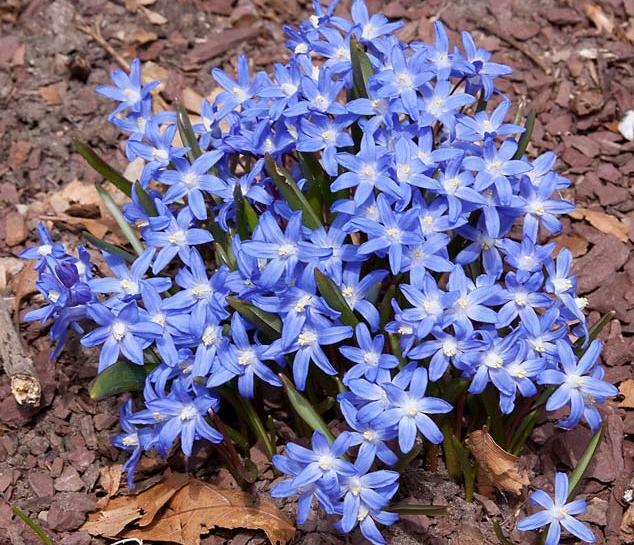 Scilla luciliae) is a free spreading early Spring small bulb that is known as Glory of the Snow. It is native of Western Turkey near Izmir. It has 2 to 3 violet blue flowers in a loose raceme that are white at the base of the tepals with white filaments. The flowers of C. lucileae are slightly larger than those of C. forbesii, with somewhat more parallel tepal margins. The filaments are most often uneven in length with parallel (sometimes barely tapered) margins. The anthers are equal in length, but will appear uneven due to the differing lengths of the filaments. The inflorescence is erect to ascending on stems four to eight inches (10 to 20 cm) tall. Sometimes it is sold in pink and white forms, possibly hybrids. Flowers are upward facing, about 3.5 cm. wide. First three photos by John Lonsdale and David Pilling. Remaining photos by Travis Owen. 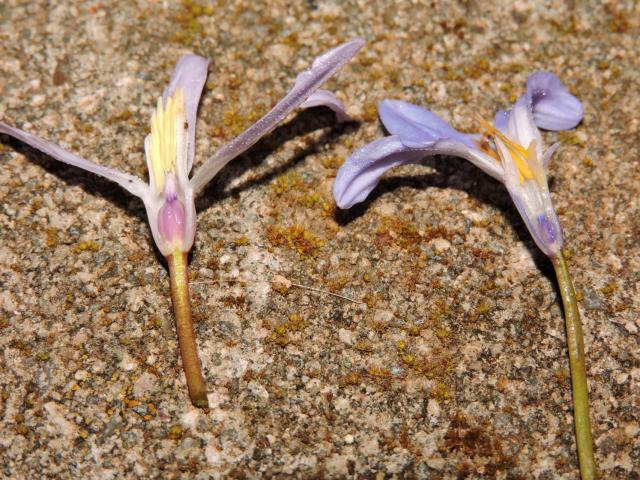 Photo 4 shows a close up of a flower, photo 5 shows dissected flowers showing the differing lengths of the filaments. Chionodoxa nana (Schult. & Schult. f.) Boiss. & Heldr. (syn. Scilla nana, C. cretica Boiss. & Heldr.) is from Crete. It has two leaves and one to five flowers per bulb. The flowers are pale blue with blue tips, and a blue stripe down the center of each petal. Chionodoxa nana subsp. albescens (syn. C. albescens (Speta) Rix) has slightly smaller flowers, whitish with lavender tips. Chionodoxa sardensis (syn. 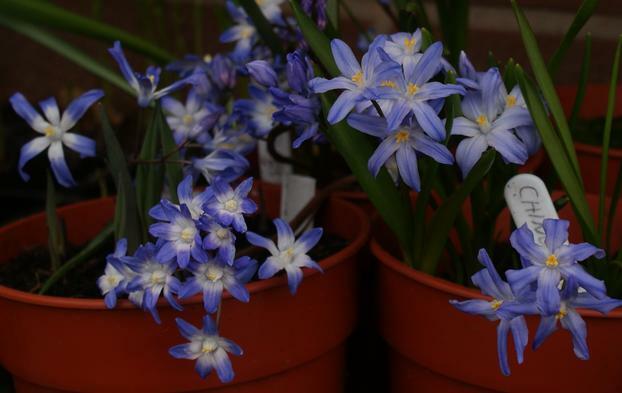 Scilla sardensis) has up to 22 bell to star-shaped flowers up to 2.5 cm wide in a loose one-sided raceme. It is purple-violet in bud, violet at opening, fading to violet blue with very little white in the center apart from the filaments. The filaments are of even lengths and wide at the base, tapering to a point. Photo of flowers from Arnold Trachtenberg is probably of this species from Western Turkey although it could also be a hybrid. 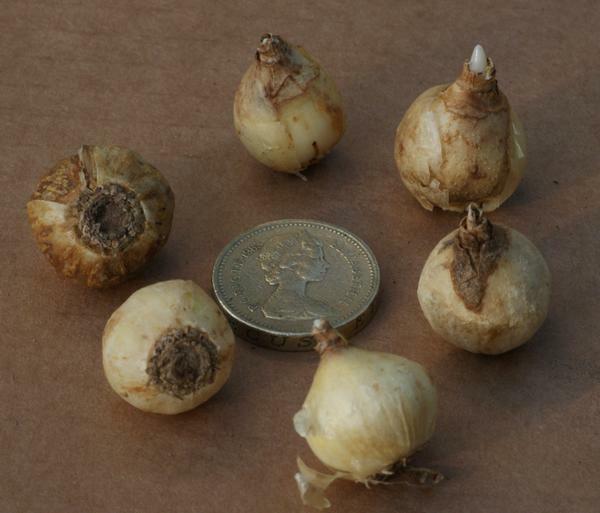 Photo of bulbs, seed pods and seed by David Pilling, the coin is about an inch in size and the grid 10 mm. 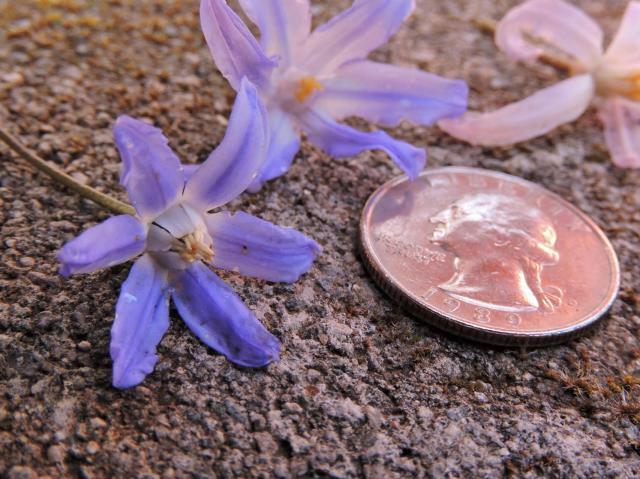 The photo below shows a flower of C. sardensis on the far left with a US quarter (just under an inch in diameter) for scale. The flowers do posses some white at the petal bases, but not as much as C. forbesii or C. luciliae.